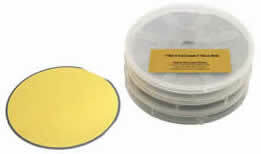 EMS offers a variety of economically priced gold coated substrates. All coatings are deposited under vacuum using electron beam evaporation. These high quality substrates are coated with 500 Å (50 nm) of gold, with a thin chromium adhesion layer (2-7 nm) between the glass and gold coating. This adhesion layer can also be replaced with titanium upon request. All substrates are pre-cleaned using an ion source for quality assurance. 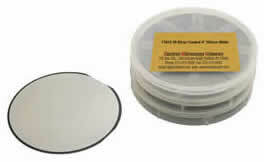 Glass slides are packed in a dedicated cleanroom environment and shipped in slide mailers. All coverslips are packed in a dedicated cleanroom environment and shipped in a X0 Gel-Pak box. 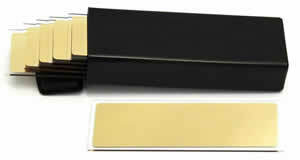 All gold substrates are autoclavable. 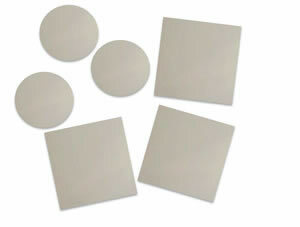 EMS offers a variety of economically priced silver coated substrates. All coatings are deposited under vacuum using electron beam evaporation. These high quality substrates are coated with 500 Å (50 nm) of silver, with a thin titanium adhesion layer (2-7 nm) between the glass and silver coating. This adhesion layer can also be replaced with chromium upon request. All substrates are pre-cleaned using an ion source for quality assurance. 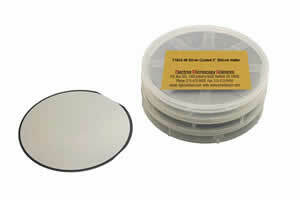 Glass slides are packed in a dedicated cleanroom environment and shipped in slide mailers. All coverslips are packed in a dedicated cleanroom environment and shipped in a X0 Gel-Pak box.